For the previous version, go here. Please follow me on the twitters! If you used a playlist to burn a disc, burn image is now correctly deleted if you do one of the following: 1) select all in the playlist and delete the songs, or 2) delete the playlist. it already worked to delete ONE song in the playlist, OR if you reordered a song. tangentially related to above: i think i may have FINALLY found the bug that would truncate (corrupt) your database! i had been setting the "end of file" marker (which truncates the unused portion of a file AFTER the end of the file), but had wrongly set the offset BACKWARDS FROM THE END, instead of FORWARD FROM THE BEGINNING. So, in special cases, if you only need to trim, say, 100 bytes "off the end", it would instead LEAVE 100 bytes FROM THE BEGINNING, then truncate EVERYTHING after that. wow. just wow. when doing a Rebuild From Scratch, it is now possible to preserve the NAMES of your singers (see link). You still have to do it manually per venue. on Windows, the store shows up even when not checked. now that it's fixed, it may suddenly turn on if you had it off. just turn it off again. fixed: Sorting. wow has been broken since 1.0.2b6! jeez. kJams would fail to save the decryption keys in a timely manner, so if you crashed, they would be forgotten. fixed. ensured that the dropbox download NAME doesn't include the URL suffix "?dl=1"
auto updater works again, dangit. but again you have to manually download the update for it to THEN start working again. Mac: fixed a certain class of "corrupted zip file" bugs. note some files are actually corrupt. now properly reports whether a song is played via "free first week" or "actual monthly subscription"
Party Tyme Pro streaming music service is available!! no visible chage: completely re-wrote the code that figures and displays (at the bottom of the main window) the duration of the selected playlist, in "casual" language", eg: "45 Minutes 12.5 Seconds"
you'll now get a warning dialog when you switch venues "are you sure?" in the "Karaoke.Net" store, "Sync Previous Purchases" works again. Why did nobody tell me this was broken until now? German, Italian, and Spanish now correctly do NOT translate "User Sort Order", it should read as "#"
removed last vestiges of TriceraSoft, R.I.P. When removing songs from kJams, we no longer scan it's containing folder for empty folders to delete. This was causing a performance problem when said folder contained thousands of files. We now just leave these empty folders to rot. Producer: alternate string measurement now measures full UTF32 characters, one at a time, instead of converting to UTF8 and attempting to measure EACH BYTE??!? DERRRRR! i *think* this still doesn't measure "glyphs" as in hindic ligatures? we'll cross that bridge when we come to it. Windows: updated python installer so it actually works, and detects itself correctly. fixed ability to create a new account at Karaoke.Net. grrrrr. fixed a UI screwup where TriceraSoft songs would show in the main library if you had set the pref "Show store songs in library" set to "All Songs". TriceraSoft is not actually available any more except under certain circumstances. Karaoke Cloud can now show you when new songs are available. You can turn this off. if you have "warn when song is interrupted" turned on, and you interrupt a song with a remote control, and you do it several times, the "Are you sure you want to interrupt the current song?" dialog could show several times, piling up. now it will only show once. new default "Less Dumb Rotation" Advanced preference "Rotation: New singers appear before current singer"
FIXED BUG: KaraokeCloud music store had info from songs mixed up (eg: the artist of one song would be labeling a DIFFERENT song). this may also have listed "audio only with no video lyrics" songs as "audio and video lyrics"
FIXED BUG: Windows: i don't know if this ever caused a problem but when GET / SET -ting the creation date of a file, i'd get the mod date, and vice versa. auto-cue (skip silence at beginning) threshold is now 0.01, instead of 0.001. is that bad? skip silence at end threshold is now the same as beginning, instead of 1/4 as sensitive. is that bad? the Flip4Mac warning happens once per session. FIXED HANG: hard to describe, trust me. when getting a playlist "as a selection". at same time, not idling graphics unnecessarily. fixed some sync errors when you enable "songs with no lyrics"
When logging out of an account (say to log into a different one), kJams will properly dissociate from the current "KaraokeCloud Tethered Database" folder. That way if you sign into a new "KC Pro" account, and it starts tethering, the dat files will go into the proper account folder, rather than into the wrong one, with the wrong encryption keys, eek! fixed an assert about "GetMusicStore()"
added secret pref in to validate the encryption on songs. it's slow. 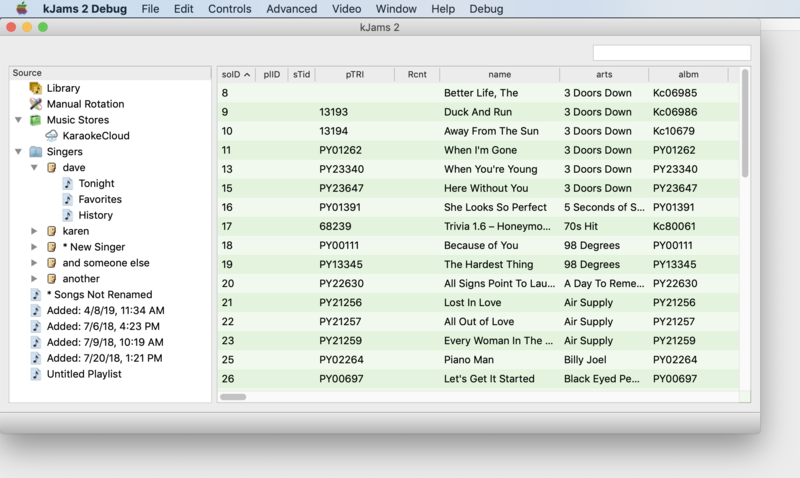 added ability to turn ON a pref that shows songs that do NOT have video lyrics. file->export->selection to CDG: now available. works if you have Producer, does nothing otherwise. if the "up card" for intro or outro won't fit in the available space, kJams will seek one with " (small)" at the end of the name. if that fails, " (tiny)". if you use a picture who's path doesn't exist, kJams would create the empty path on your hard drive. this is fixed. if you got the error about "initializing audio output", it may have been about that the channel was already taken. made the error message more clear about that. factored a bunch of code relating to "paused"
fixed the database backer-upper: it now really does save more than a day's worth of backups. wow. just wow. This page was last modified on 11 April 2019, at 12:28. This page has been accessed 29,068 times.